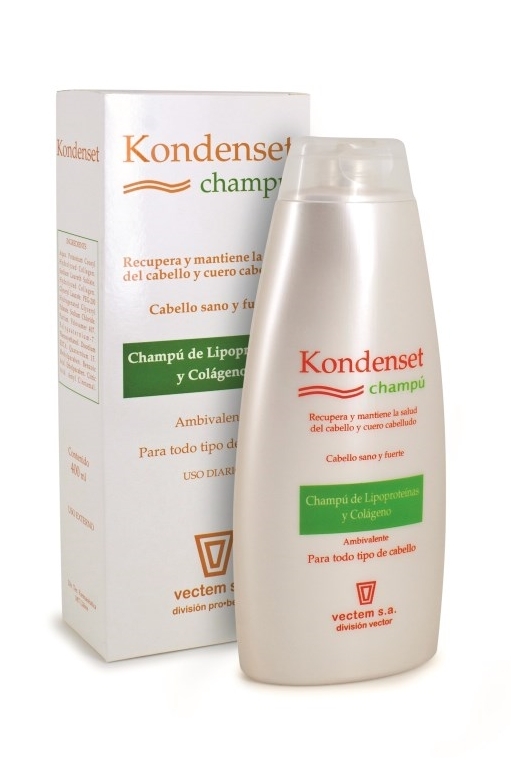 KONDENSET SHAMPOO , vectem s.a. Formulated with lipoproteins and hydrolysed collagen to gently, respectfully and progressively cleanse and repair the hair and scalp. The gentle foaming action of lipoproteins is well tolerated by the skin and hair. They help relieve scalp irritation and reactivity. Hydrolysed collagen helps repair the hair shaft, leaving it sleek and shiny. Suitable for dry and oily hair. Contains moderate, but sufficient amount of conditioner. Other stronger treatments may subsequently be used.